The First International Mindat.org Conference was held in Poland, the second one in Morocco. 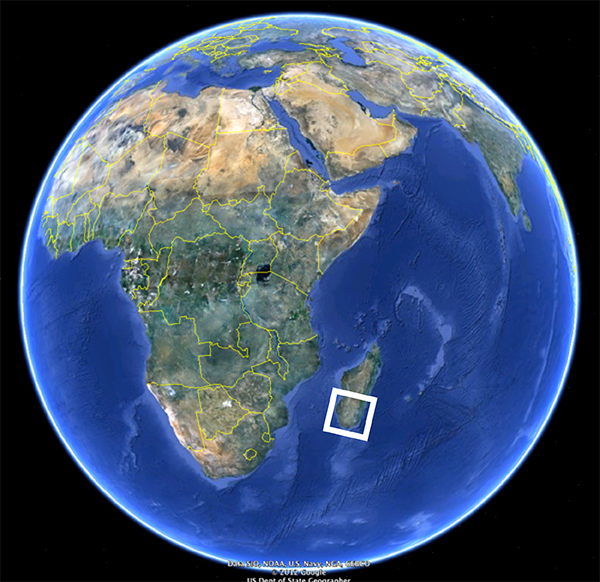 This time the idea was more adventurous – Madagascar! There were 60 participants, so only half as many as in Morocco. But making field trips to Madagascar for even 60 is an enormous challenge! Area we visited during the 3rd Mindat.org Conference in Madagascar. Google Maps. The preparations started two years before the Conference. 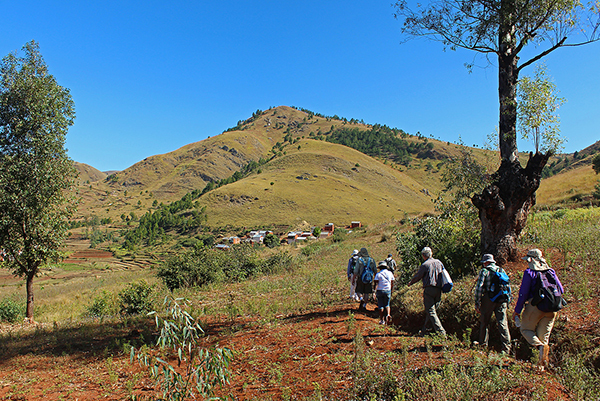 Tom travelled to Madagascar several times to arrange the hotels, food, cars, aircraft charters and numerous field trips. Chartering two planes within Madagascar was a major challenge itself not speaking about everything else ... As far as we know it was the biggest group ever visiting Madagascar, many people we met on our way during the preparations thought we were crazy planning something like that … Luckily the organizing team – Giorgio and Malala (from MyMadagascar.it), Noro and Tony as well as Ida helped a lot and did an incredible work. 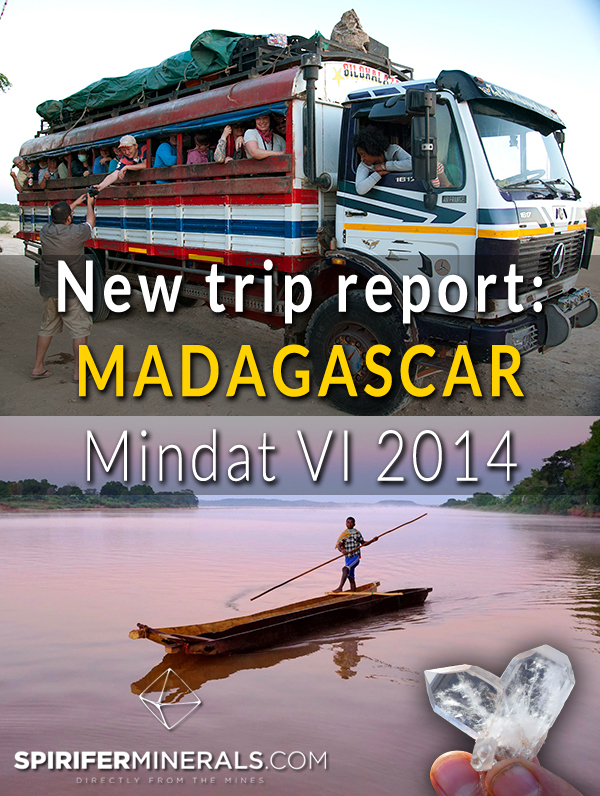 To keep an eye on the last details, Tom left for Madagascar one week before the Conference. He and Giorgio did our 2 weeks plan in just 2 days visiting all the hotels, restaurants and other places. It was a crazy trip, driving day and night long, but it was important to button everything up before arrival of the Mindaters. Tom - organiser of the Mindat.org Conference in Madagascar. R. Lang photo. Giorgio Maggioni (www.mymadagascar.it) co-organizer of the Conference. R. Lang photo. Ida Chau, Giorgio Maggioni and Agata Leszczuk - part of the organizing team. M. Ng photo. Noro and Malala, co-organizers of the Conference. I. Chau photo. The whole conference took 16 days. 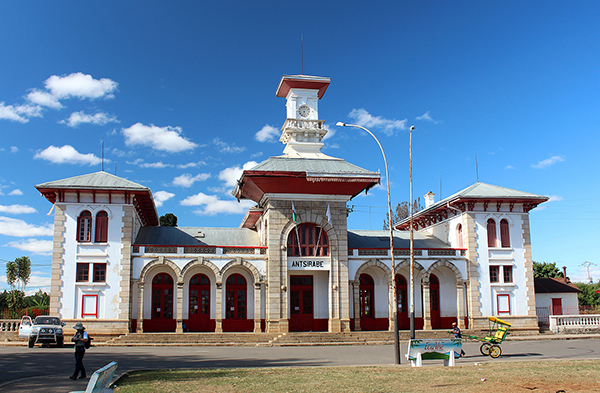 Registration started on 28th of May in the Central Hotel in Antananarivo – the capital on Madagascar. 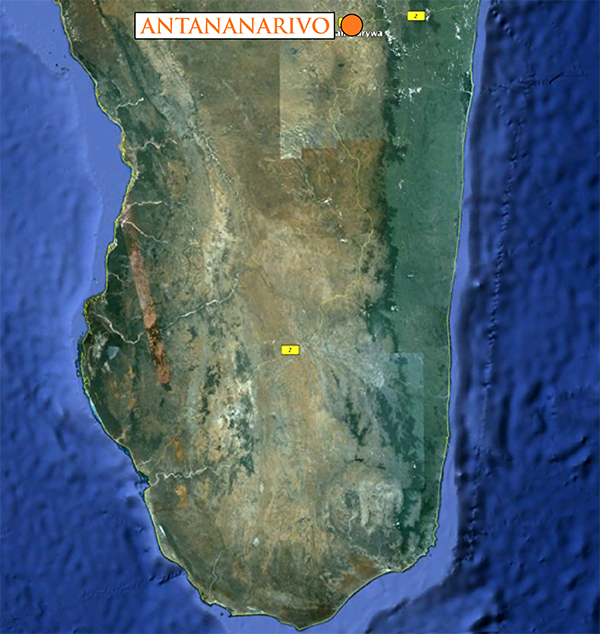 There are only two international airports on Madagascar (second after Antananarivo is Nosy Be in the far North) so everyone arrived at the same place. During registration participants were given their badges and conference programes. 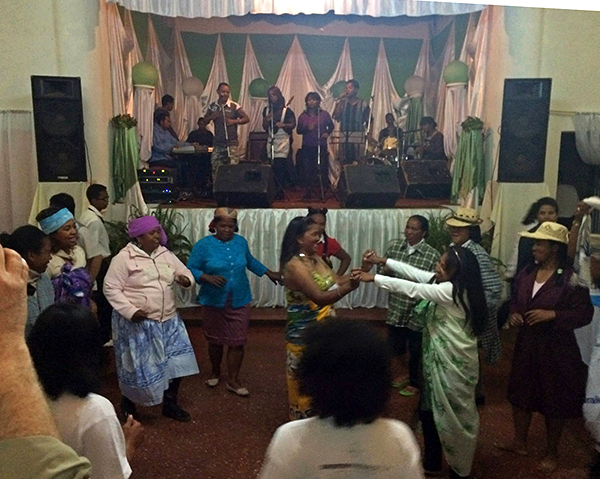 Then, in the evening, there was a dinner in the hotel and the Conference opening party with traditional Malagasy music. Everyone was pretty tired that night, after the long journey to Madagascar. 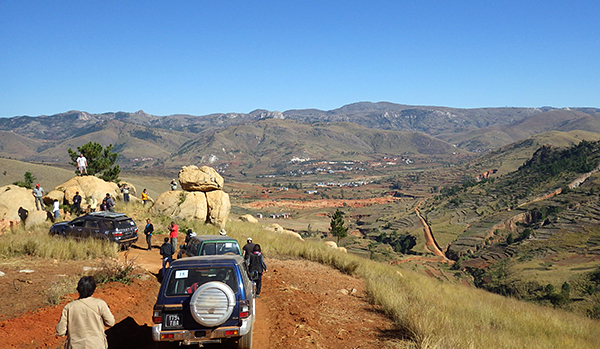 Participants flew to Antananarivo (Tana), capital, from many different directions. Google Maps. Transfer from airport to the hotel was organized for all participants. E. Petrides photo. Those who arrived a little bit earlier had some time to visit Tana. M. Ng photo. Royal palace located on the highest hill of the city, one of very few bigger old buildings in Madagascar. E. Petrides photo. Royal palace (reconstructed after a big fire) in Tana. K. Luk photo. Rouins of the Palace on the highest hill in Tana. K. Luk photo. Church in the oldest part of the town. M. Ng photo. Market on Tana`s streets. E. Petrides photo. Market on Tana`s streets. R. Zeilstra photo. Everyone who exchanged money became a multi-millionaire! The biggest Malagasy bill is equivalent to 5$! M. Ng photo. 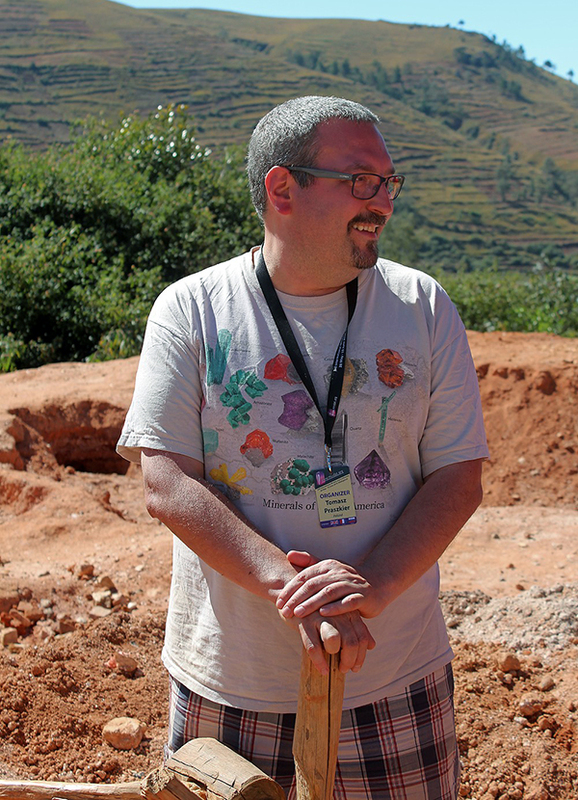 Wolfgang Behrenbruch on the mineral market in Tana. He didnt know that next day he would brake his leg... R. Zeilstar photo. Evgenios buying aquamarine crystal on mineral market. E. Petrides photo. 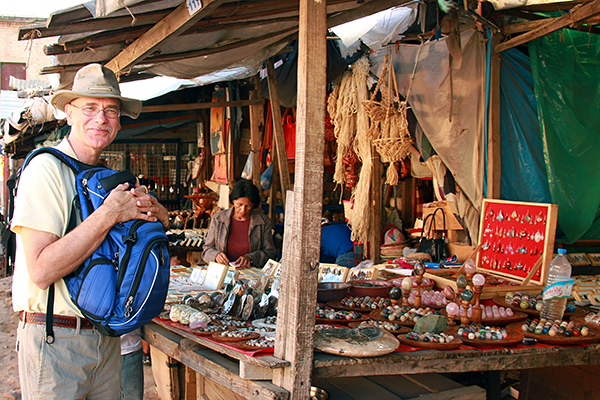 On the mineral market in Tana. M. Ng photo. On the mineral market in Tana. E. Petrides photo. Fake demantoid specimen on the mineral market. M. Ng photo. Evening view from our hotel to the downtown. M. Ng photo. Official opening of the Conference - all organizers are present (from the left): Ida chau, Tom Praszkier, Giorgio Maggioni, Sergico Malala, Tony Randreth, Noro Razafindramino. K. Luk photo. Traditional dances at the Conference opening. M. Ng photo. Professional player of valiha - the most traditional Malagasy instrument. M. Ng photo. Participants at the first dinner. K. Luk photo. 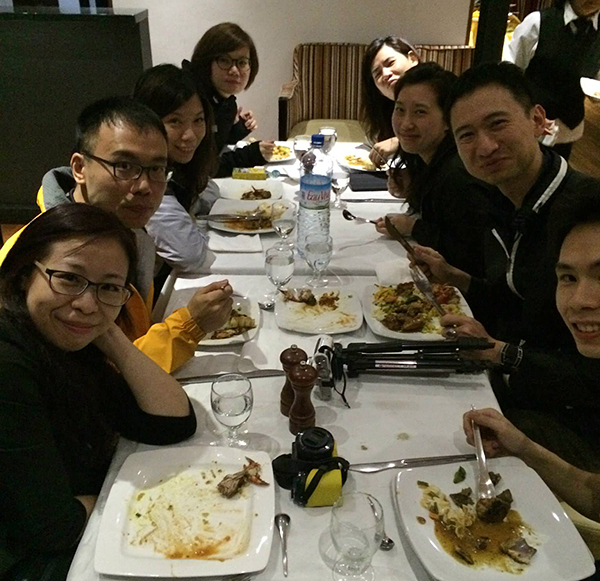 Hong-Kong gang at the first evening dinner. T. Praszkier photo. 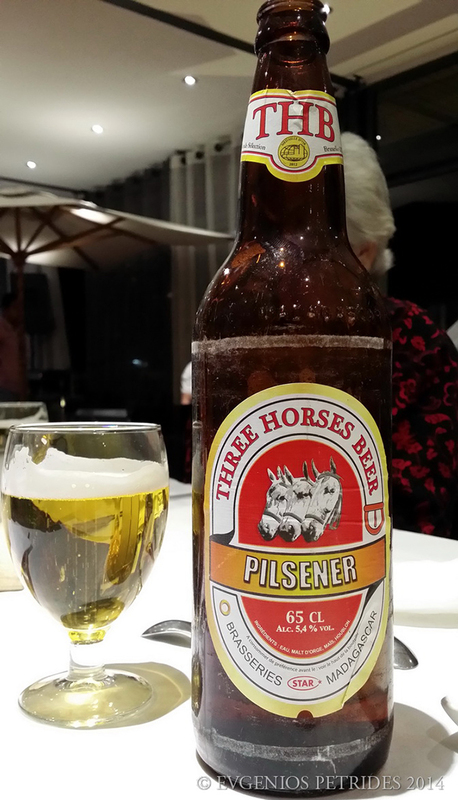 We introduced the famous Three Horses Beer to all particpants and ... E. Petrides photo. 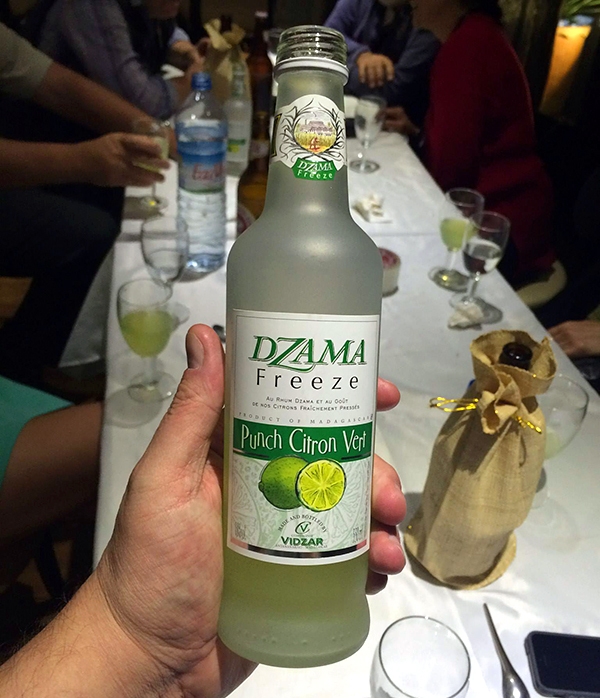 ... a Citron Punch with rum arrived too. T. Praszkier photo. On the morning of May 29th, after breakfast, we left Tana (that’s what the locals call Antananarivo) and drove to Antsirabe - a city about 160 km south from the capital. 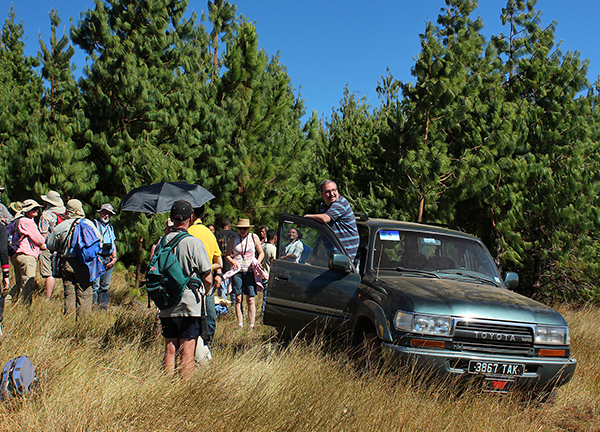 We had 18 4WD cars with drivers hired for the whole trip. When we got to Antsirabe, we checked in the Hotel de Thermes. We were staying there for 3 nights. After lunch, finally, there was some time for minerals. 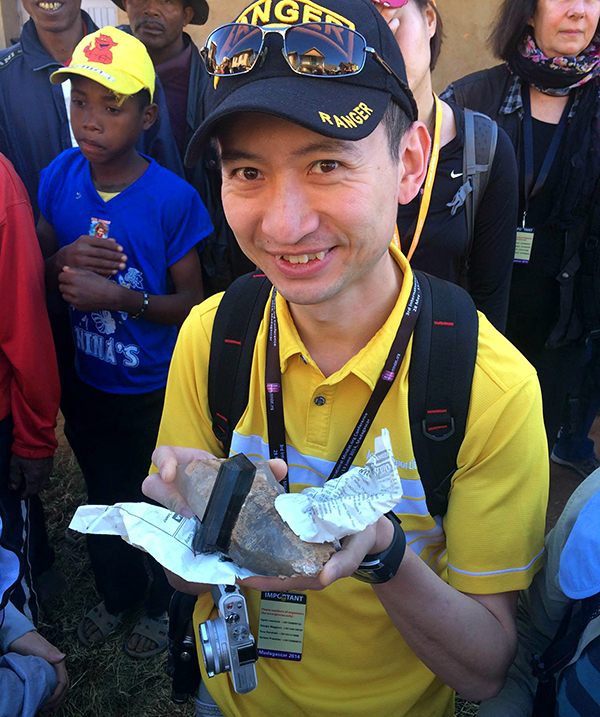 We visited a local mineral and gemstones market where everyone could buy nice specimens mined on Madagascar, as well as some fake or highly “tuned” ones. 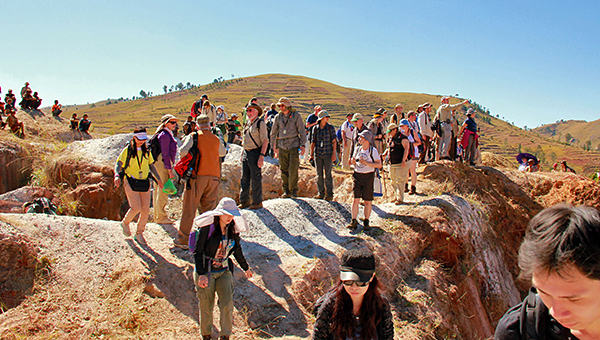 Then the participants were taken to a very picturesque nearby volcanic lake which fills an extinct crater – Lac Tritriva. An interesting fact about the lake is that the water level rises in the dry season. After this short trip there was a party and dinner at the mineral market together with local dealers and collectors. Unfortunately, that was the last night of the Conference for one of the participants – Wolfgang from Canada. He stumbled on a pous-pous (rickshaw) and fell, breaking his leg and elbow! The leg fracture was serious, so after a long night and morning in a Malagasy hospital, taken care by Tom, Giorgio and Malcolm, Wolfgang got to the airport in Tana and was flown to Reunion Island, a French overseas department 700 km from Madagascar, where he underwent surgery. We all were very sorry that he suffered and missed the Conference, but at least Reunion was not a bad place to stay and recover! 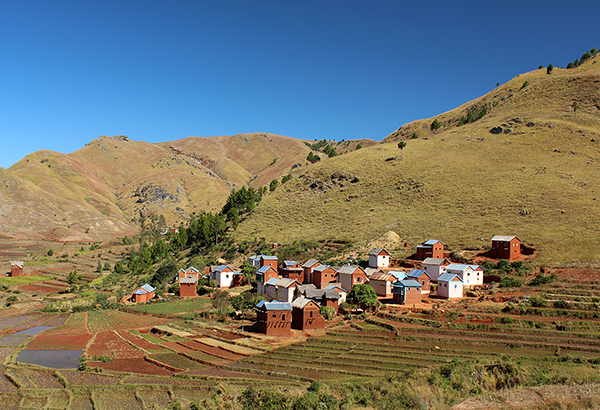 Next morning we drove from Tana to Antsirabe. Google Maps. Our cars waiting at the hotel entrance. T. Praszkier photo. 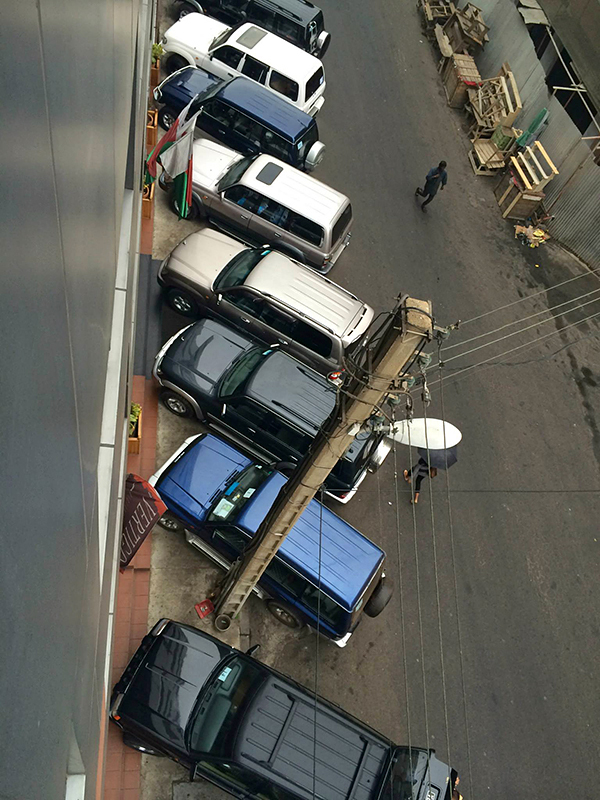 Our cars in the front of the Hotel des Thermes in Antsirabe. J. Rakovan photo. Beautiful, post-colonial, Hotel des Thermes in Antsirabe. M. Ng photo. Lunch in Hotel des Thermes after arrival. M. Yu photo. That day we had some time to visit Antsirabe, here train station (of course not working!). R. Lang photo. Antsirabe is famous for pous-pous (rickshaws). L. Albin photo. Vanilla is sold on the streets. E. Petrides photo. Do you need some bread? E. Petrides photo. On Antsirabe streets. E. Petrides photo. On Antsirabe streets, poor chickens ... C. Voogt photo. 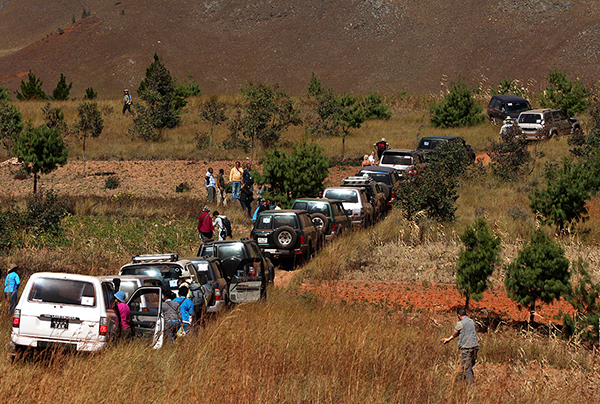 Finally our group headed to the mineral market in Antsirabe. M. Ng photo. Our group on the mineral market in Antsirabe. R. Lang photo. Our group on the mineral market in Antsirabe. K. Luk photo. Happy John Rakovan, Jamie Newman and Alan Esner on the mineral market. 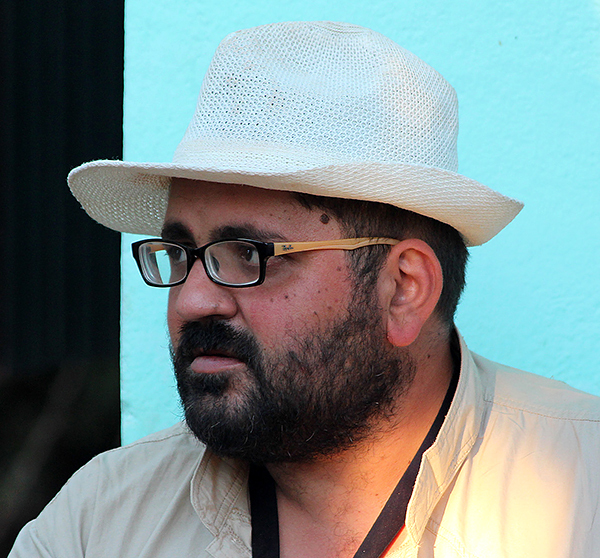 M. Rakovan photo. On the mineral market. J. Rakovan photo. On the mineral market. E. Petrides photo. On the mineral market. M. Ng photo. 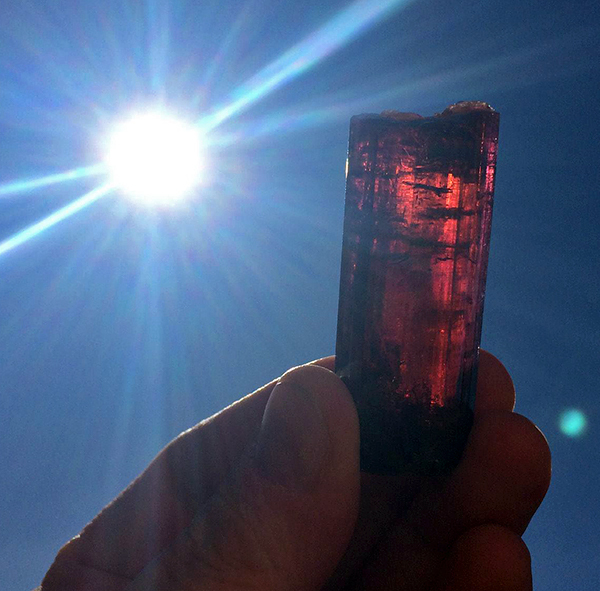 Freshly mined tourmaline lot on the mineral market. T. Praszkier photo. Evgenios with huge beryls on the mineral market. E. Petrides photo. 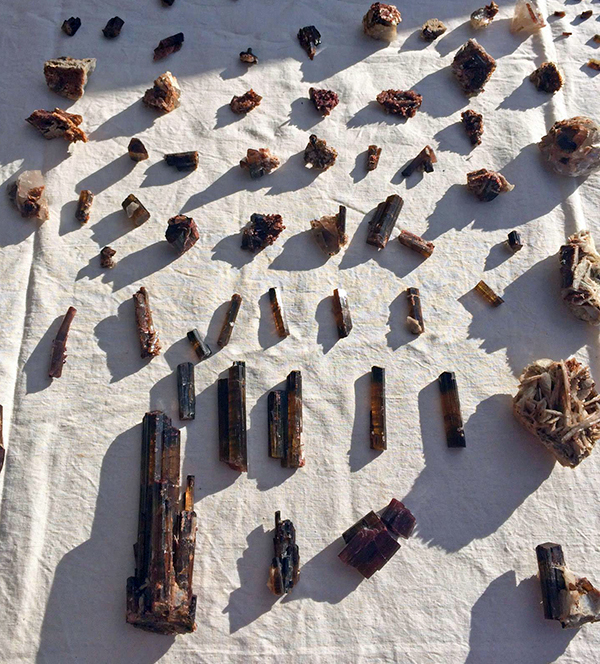 Tourmaline slices on the mineral market. M. Ng photo. 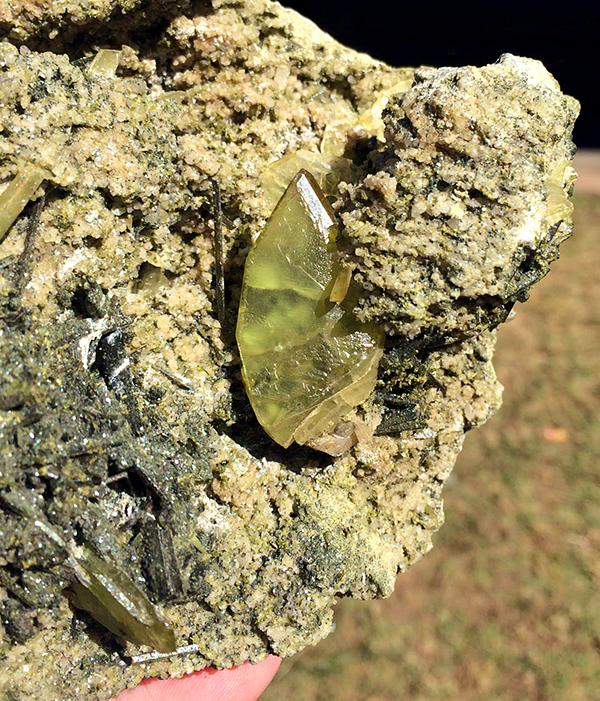 Titanite specimen on the mineral market. T. Praszkier photo. Rubelite on the mineral market. T. Praszkier photo. 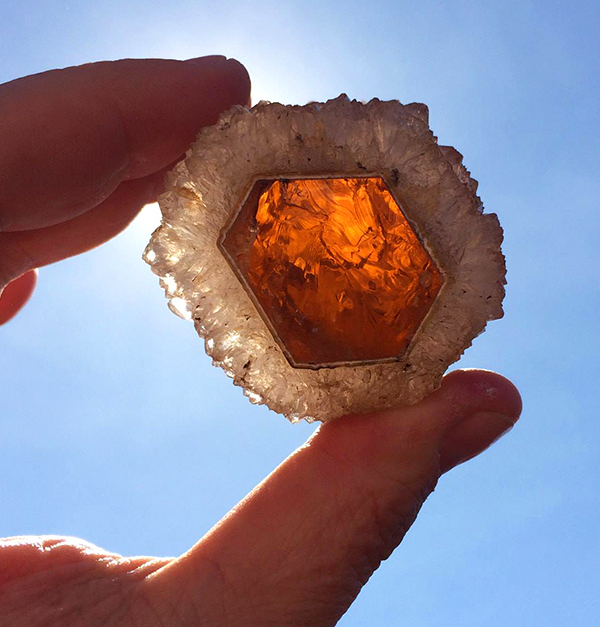 Unique specimen of deep orange citrin crystal coated by colorless quartz, photographed on the mineral market. T. Praszkier photo. 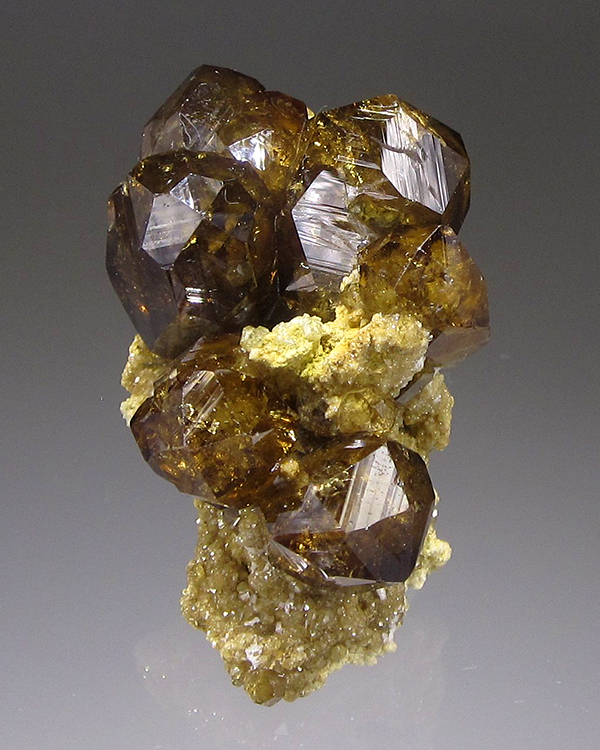 Topazolite (andradite) specimen bought on the mineral market in Antsirabe. J. Rakovan collection photo. 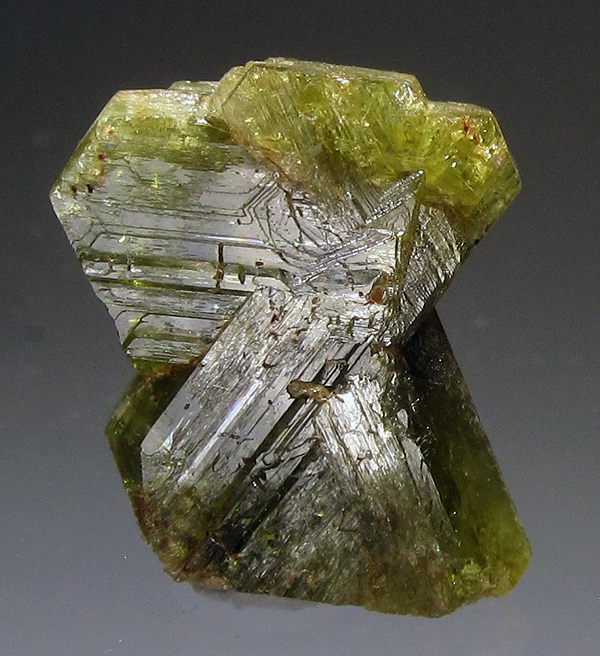 Twinned chrysoberyl. J. Rakovan collection and photo. Some of us (here Michael Treloar) tired with minerals spent some time drinking beer :-) E. Petrides photo. Part of the group went to see Lac Tritiva, volcanic lake placed in caldera. K. Luk photo. At Lac Tritiva. L. Albin photo. Preparation for evening party. E. Petrides photo. Evening party was very special, it took place on the mineral market and we invited local dealers and miners. Here opening talk by Presideent of the local dealers association and Tom. K. Luk photo. We listened to the live music. K. Doxsee photo. Rhonna Jewett and John Veevaert enjoying the rum at the party. M. Southwood photo. Traditional dances by mineral dealers in Antsirabe! T. Praszkier photo. And than this happend ... Wolfgang from Canada broke his knee and elbow while leaving the party. In the darkness he tripped over a rickshaw`s handle. His kneecap broke into 3 parts! 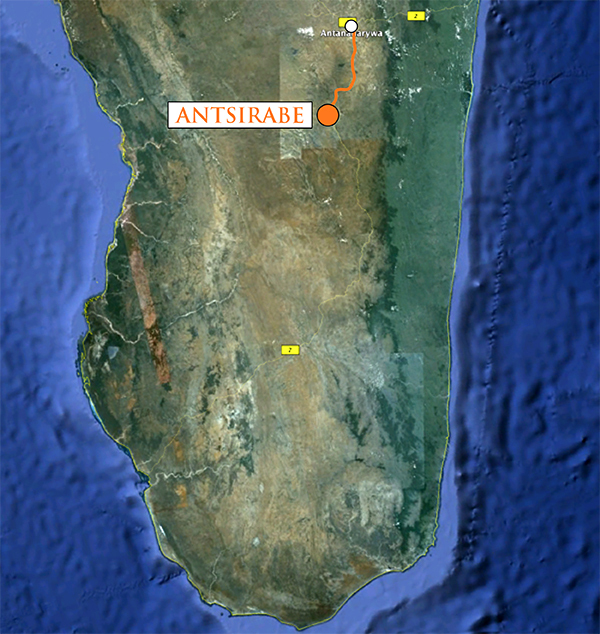 He was extracted in less than 24 hours to Reunion Island where he was operated on. We all felt very sorry for him. T. Praszkier photo. The next day, while Giorgio was struggling with organization transport etc. 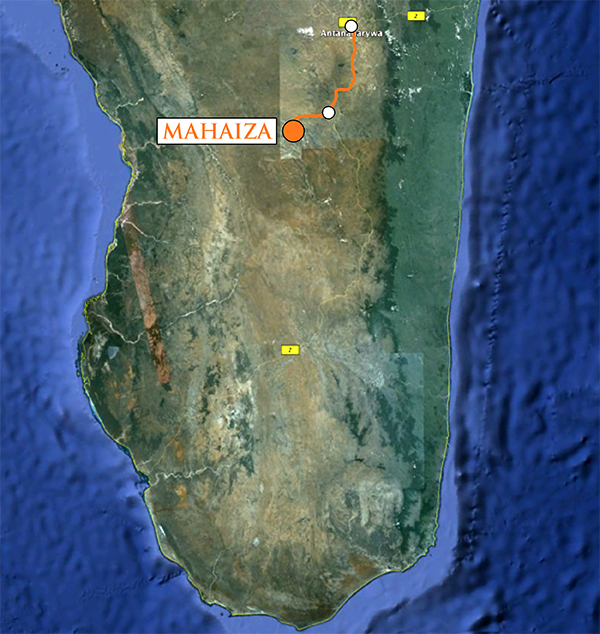 for Wolfgang, the rest of the group drove to Mahaiza village, where there was a possibility of buying specimens, mostly quartz, on the local market. Many people were shocked by this very crowded, traditional market where once a week people from the surrounding mountains come and bring different goods to sell or exchange to necessary products of the town. They bring, for example, minerals! From Mahaiza we drove to the Tsaramanga pegmatite – an LCT beryl columbite subtype pegmatite, famous for aquamarine, big columbites and rose quartz. It was possible to collect some minerals there. In the field everyone got their lunch prepared in small packs. After collecting we got back to the hotel about 5 pm, so we had an hour to refresh and prepare for dinner, which took place at the Razafimamonjy restaurant, where a traditional Malagasy band was playing for us. The Razafimamonjy restaurant belongs to the owner of the mine in Sahatany Valley which we were going to visit the next day. During the dinner we also celebrated a very big day for Roger Lang – his 50th birthday! He received a birthday cake and the whole restaurant sang “Happy Birthday”. After the dinner we returned to the Hotel de Thermes, where some people kept on celebrating with Roger till the early hours. 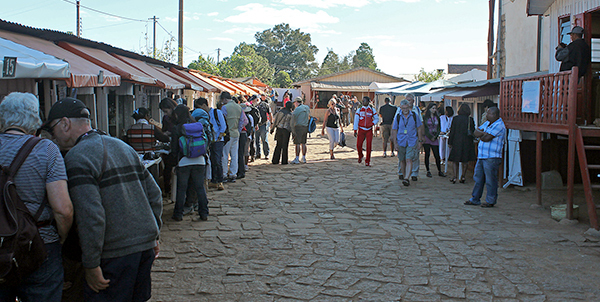 Next day we visited the market in quite remote village - Mahaiza. Every week people from the mountains come to the market to exchange their products for the things brought from the bigger towns. Google Maps. 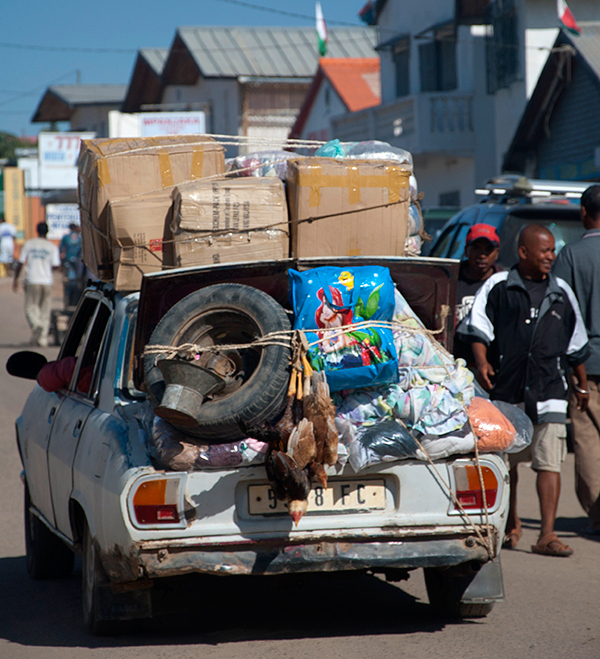 Our 18 cars on the Mahaiza market, it brought on a big excitement among local people. E. Petrides photo. Market was very crowded that Friday. E. Petrides photo. On the Mahaiza market. E. Petrides photo. On the Mahaiza market. K. Doxsee photo. Traditional black-smithing on the Mahaiza market. K. Doxsee photo. On the Mahaiza market. M. Ng photo. On the Mahaiza market. L. Albin photo. Our group surrounded by the local miners offering mineral specimens. E. Petrides photo. Minerals on the Mahaiza market. E. Petrides photo. Happy Miro with freshly bought tourmaline specimen on quartz. T. Praszkier photo. We needed police to help us to drive through the market with our caravane. E. Petrides photo. On the way to Tsaramanga. L. Albin photo. Our caravane arriving to Tsaramanga quarry. R. Lang photo. Tom had a short presentation beofre going to the quarry. R. Lang photo. 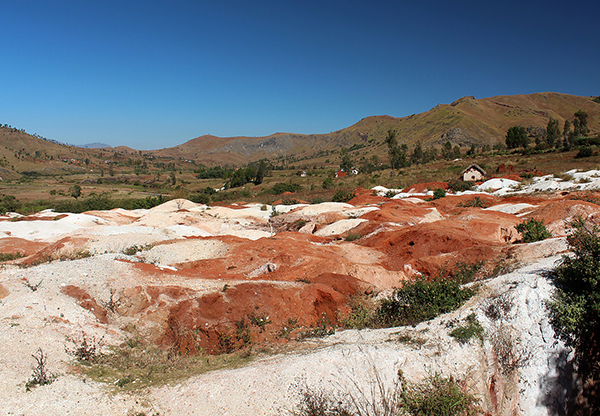 Tsaramanga quarry, famous for aquamarine, columbite and rose quartz. E. Petrides photo. Pegmatite visible in the walls of the Tsaramanga quarry. J. Rakovan photo. 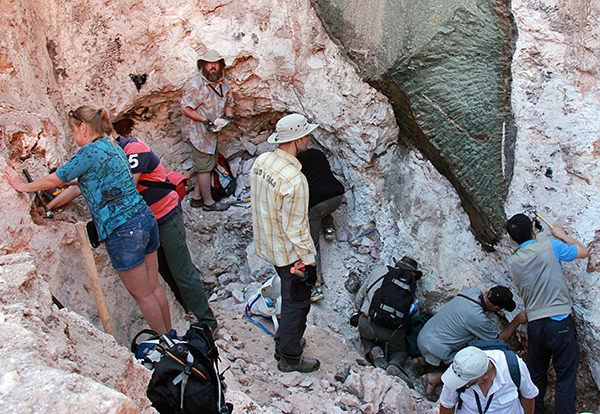 Our group collecting in the Tsaramanga pegmatite. R. Zeilstra photo. Happy Leslie Gordon with rose quartz. E. Petrides photo. Miro collecting. M. Ng photo. 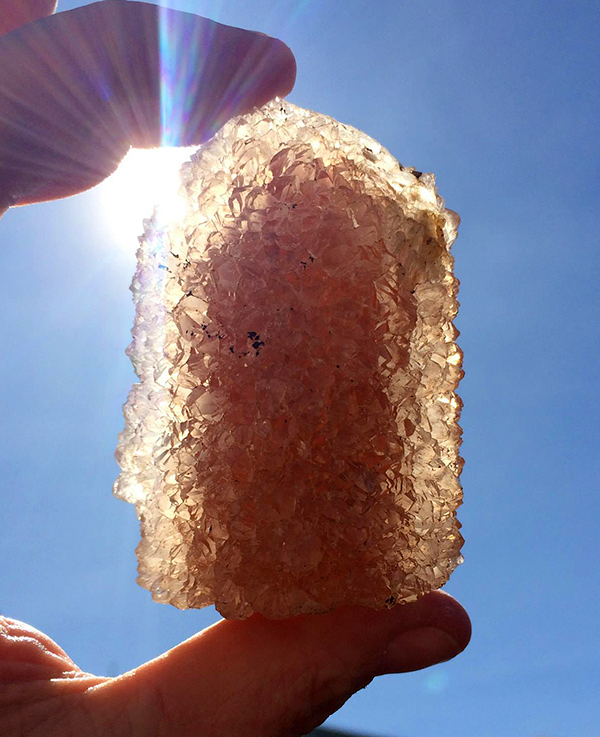 Freshly mined rose quartz. E. Petrides photo. This evening we had a great dinner with traditional music in Razafamamonjy restaurant in Antsirabe. K. Luk photo. and Roger Lang had his 50th birthday. M. Ng photo. Birthday gift for Roger, celestite from Madagascar. M. Ng photo. This evening party continiued in the hotel to late hours. Stars were incredible that evening. M. Ng photo. After breakfast we drove to the Sahatany Valley, which took us about 2 hours. 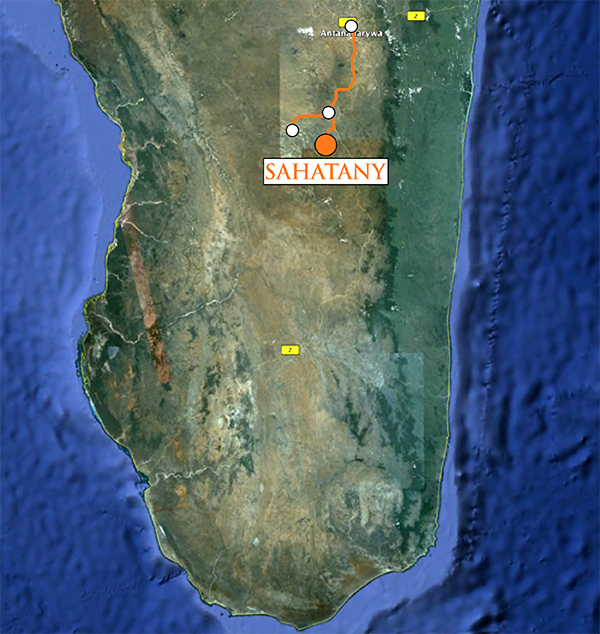 The Sahatany pegmatite field is one of the most productive and famous areas for minerals and gemstones in Madagascar. It’s famous mostly for multi-color tourmaline, beryl and spodumene. Several mineral species have their Type Locality there, for example behierite, manandonite, bityite. This day we were accompanied by Dr. Frederico Pezzotta – our friend, famous mineralogist and Mineral Curator at the Natural History Museum of Milan, for whom Sahatany Valley is like a second home. Frederico has spent a lot of time researching the origin of gem-bearing pegmatites there. 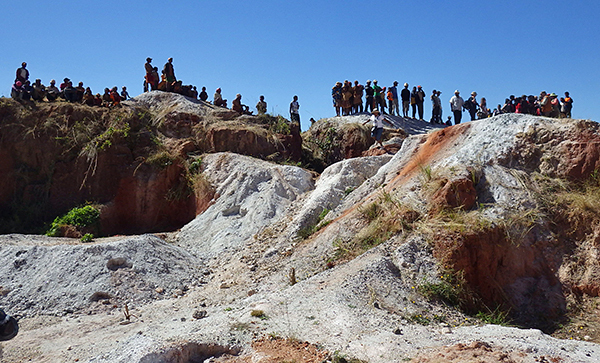 He was our guide that day and showed us several smaller pits in pegmatite deposits, but the icing on the cake was a visit to the underground working in Ampatsikahitra where everyone had the chance to go underground and see the fresh, unweathered pegmatite body – a real rarity in Madagascar. Visiting the underground workings took some time with such a big group. It was possible thanks to the kindness of Silvain, the owner of the mine (and the Razafimamonjy restaurant.) In most of the places we visited that day it was also possible to buy minerals, because local mineral dealers were almost everywhere. It was quite a long and tiring day for most of the group, we walked a lot, and we had to get up early the next day, so after a dinner in the hotel almost everyone went to sleep quite early, there was no party that night (at least no official one!). We spent the whole next day in famous Sahatany Valley, rich in gem bearing pegmatites. Google Maps. Our group arriving to Sahatany. K. Luk photo. 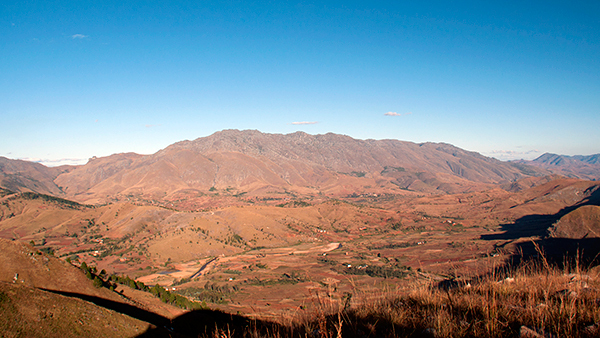 View to the valley with visible villages and white kaoline dumps. N. Anstee photo. Preparing for presentation :-) I. Chau photo. Federico Pezzotta, our special guest, presented an introduction to the geology and mineralogy of the area. R. Lang photo. View to the valley with the more important pegmatites we visited (marked) and our trail (orange line). N. Anstee photo. Driving to the bottom of the valley. M. Ng photo. Our visit made all locals very excited, all inhabitants observed us closely. N. Anstee photo. Kids excited by visit of such big group of foreigners. M. Ng photo. Kids excited by visit of such big group of foreigners. L. Albin photo. 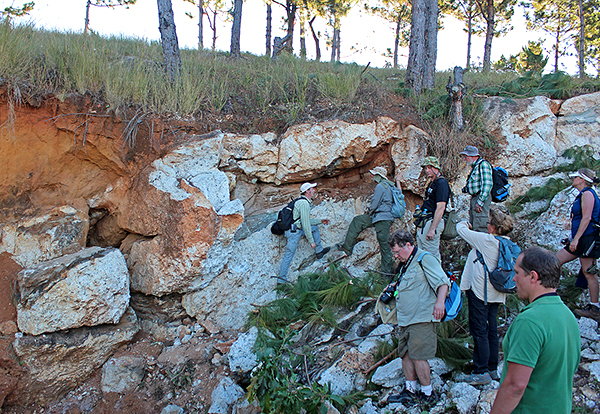 Mindaters in the Tsarafara pegmatite. R. Zeilstra photo. 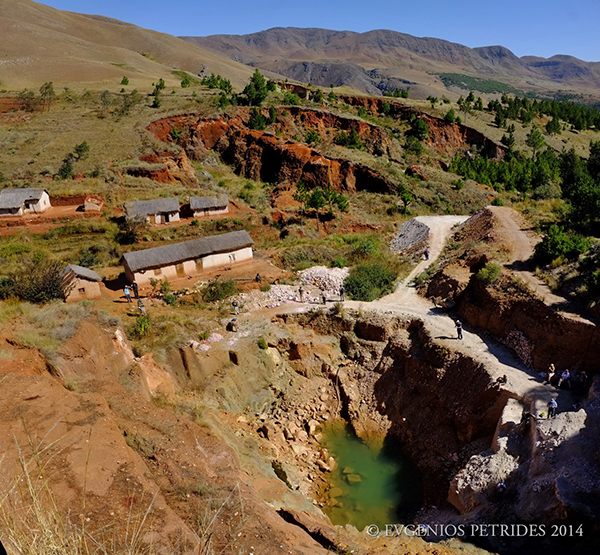 Workings in Tsarafara pegmatite. E. Petrides photo. Looking for gemstones in a weathered pegmatite. E. Petrides photo. Young collectors :-) E. Petrides photo. Maybe you would like to buy some tourmalines? E. Petrides photo. Miner going down to the shaft in Tsarafara pegmatite. S. Szlinke photo. 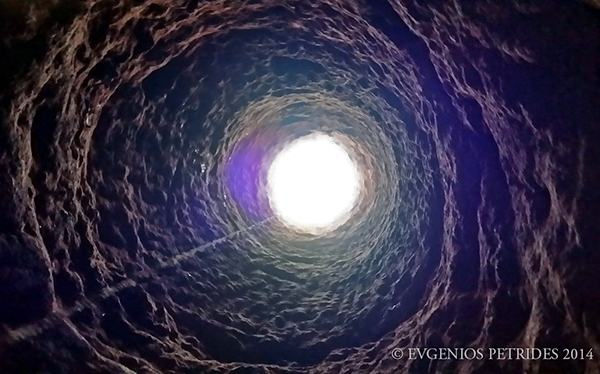 Looking inside the shaft ... E. Petrides photo. ... and from the shaft up. E. Petrides photo. Tourmaline seller. E. Petrides photo. Walking through the Sahatany Valley. J. Rakovan photo. Walking through the Sahatany Valley. E. Petrides photo. Second pegmatite was Estatoby, heavily mined in last years. R. Lang photo. Miners in Estatoby pegmatite. M. Yu photo. Later we walked up to the Ampatsikahitra pegmatite. R. Lang photo. Walking through the Sahatany Valley. R. lang photo. Federico at the entrance to the Ampatsikahitra mine. E. Petrides photo. Waiting for their turn to visit the mine. M. Ng photo. Miro inside the pegmatite. M. Ng photo. In the mine tunnels. E. Petrides photo. Huge tourmaline sections in the Ampatsikahitra mine. M. Ng photo. 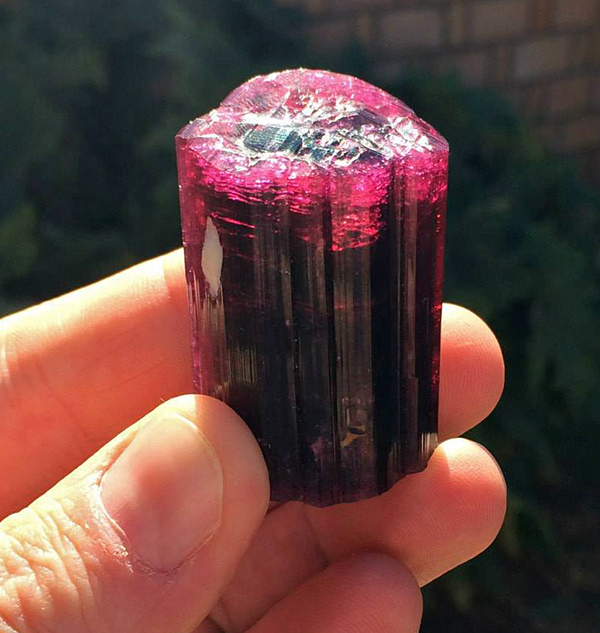 Huge tourmaline in the Ampatsikahitra mine. K. Doxsee photo. Collecting on the Ampatsikahitra mine dumps. S. Szlinke photo. Going back to the valley, typical savanna landscapes of the area. J. Rakovan photo. Miners in the Tamponilapa pegmatite, source of the world best hambergite. J. Rakovan photo. Miners in the Tamponilapa pegmatite. E. Petrides photo. 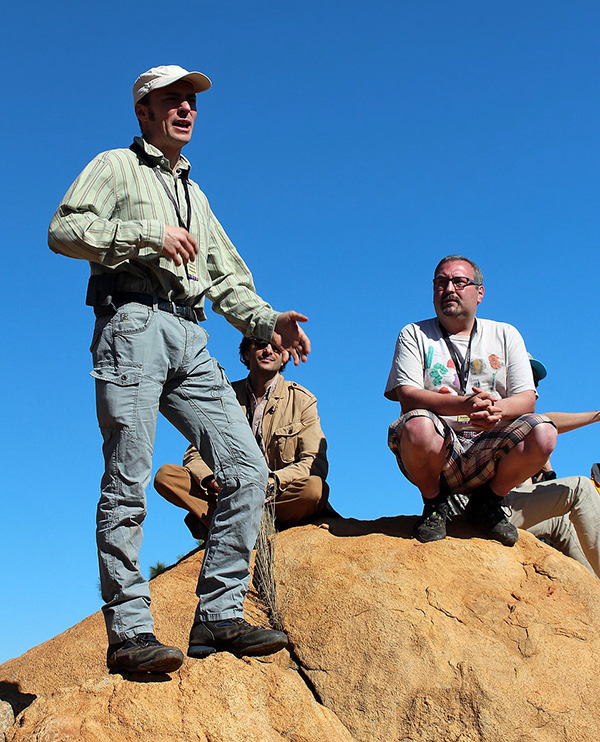 Discoussing geology in the outcrop in Tamponilapa. R. Lang photo. 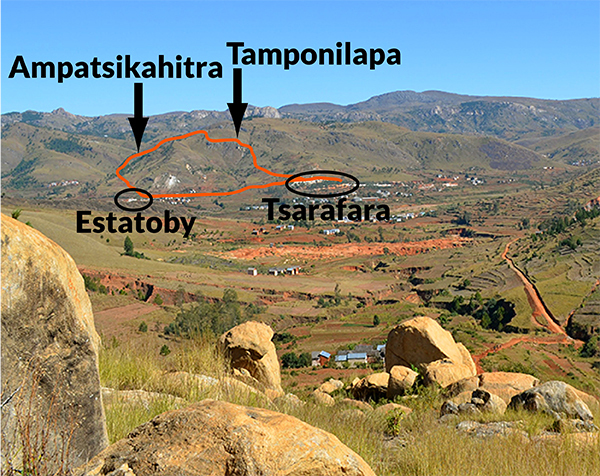 Contact of the pegmatite with-host rocks in Tamponilapa. J. Rakovan photo. View to the Ibity mountain and Sahatany Valley. M. Southwood photo. Dinner after coming back to the hotel in Antsirabe, all participants were very tired that evening. M. Ng photo. 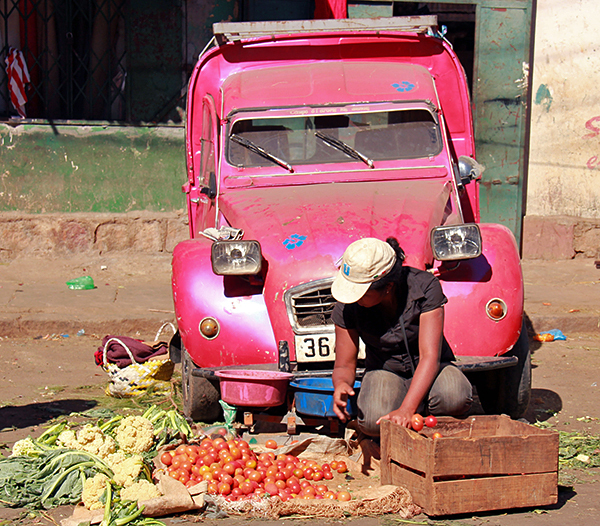 You could find some surprises on your plate, typical Madagascar ;-). E. Petrides photo. Great tour ! I would like to be there ! Excellent pics and commentary as always ... thanks for documenting it for all of us to enjoy and learn from!